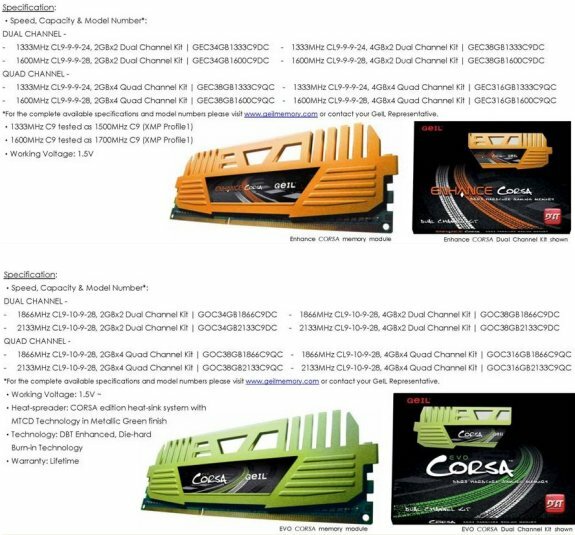 GeIL introduced a bunch of new Enhance Corsa and Evo Corsa DDR3 memory kits. The Evo Corsa is geard for overclockers, consisting of DDR3-1866 MHz and DDR3-2133 MHz kits. The modules are put through rigorous testing to make them tolerant to high DRAM voltages and extended operation under high voltages, making them perfect for high 24x7 overclock scenarios. All kits in this series are packed with memory timings of 9-10-9-28, and DRAM voltage of 1.5V. Like with Enhance Corsa, this series consists of 2x 2GB, 2x 4GB, 4x 2GB, and 4x 4GB kits. GeIL did not give out pricing and availability information.